In Clocks > Seth Thomas Clocks > Show & Tell and Clocks > Mantel Clocks > Show & Tell. Just picked up this Seth Thomas Mantle Clock at an Estate Sale for $20. Model E511-003 Lynton 1W. Does anyone have info on it. When it was manufactured, type of wood, and of course value. It appears to work fine, chimes, and has the original key. Thanks. Hi are you a clock collector or were you thinking about selling your tambour? What you do with it is your business, but if you're selling it don't say so on this board or your posting might get taken down. I spent a fair amount of time researching a Poster's Viking Grandfather clock and when he pitched his clock, his posting disappeared quick, fast and in a hurry! I don't have a Lynton 1W in my reference materials but I do see a Lynton 2W. As you might imagine, it looks almost identical to your clock right down to the hands and case design specifics. The 2W was from circa 1961 and had brown Arabic numerals against a light dial. 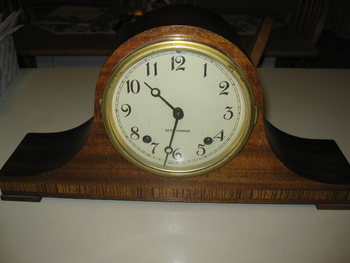 At the time it was one of Seth Thomas' most popular tambour clocks. Its small size (8 /14" high, 16 3/4" wide, 4 3/4" deep) gave the owner many placement/display options. Wood is mahogany with contrasting lighter band along the base. Since it was a very popular clock, and manufactured recently it is still pretty common. If you follow this eBay link you should be able to get some idea of what their current market value is: http://www.ebay.com/csc/i.html?_nkw=seth+thomas+lynton&_in_kw=1&_ex_kw=&_sacat=See-All-Categories&_okw=seth+thomas+lynton&_oexkw=&_adv=1&LH_Complete=1&_udlo=&_udhi=&_samilow=&_samihi=&_sadis=200&_fpos=Zip+code&_fsct=&LH_SALE_CURRENCY=0&_sop=12&_dmd=1&_ipg=50. As you can see, the prices are all over the map, but you did pretty good for 20 bucks. Hope that helps. If so, please indicate "Mystery Solved". Thank you for the help Bruce99. Not too many of this model around, most are either electric or the 2w. You're welcome, and you're right! You don't see many 1Ws. It is a good clock to have in your collection. It has a very nice style. We have the same clock at home, ST Lynton IW, Model E511-003, but it doesn't have a key :( and we are looking for one but not sure of the correct key size. Where do I look inside the clock to determine that? By any chance that you have some info about the key size? In advance, thank you very much. By the way, the inside says A200-033 5006, I understand it is an A-200 clock movement, but what about 033 and 5006? What do they mean? Any idea? Again, thanks very much! Not sure about the numbers on these later Seth Thomas mantel clocks. Seth Thomas slowly lost it's company identity to General Time and German made movements after World War II. Perhaps another collector can help you. As far as the key is concerned, if Rutger doesn't respond, you can measure the main winding arbors to find the appropriate key size. The only problem is that you really should have a double-ended winding key. The large end is used to wind the mainsprings while the small end is used to regulate the speed of the clock's movement. Seth Thomas mantel clocks typically use a size 6/0000 or a size 4/0000. The best option would be to take your Seth Thomas to a local clock shop that sells keys. That's assuming that there is one close by. Hi Bruce99, thank you so much for the information, it was very helpful. I hope Rutger7 will get to see this and confirm the correct key size...if not, I'll try both size 6 & 4 :) Again, many thanks for your helpful info! You're very welcome. Good luck with the key size and with the health of your clock! I am happy to check the key. How would I measure it for size? The key is not double ended. 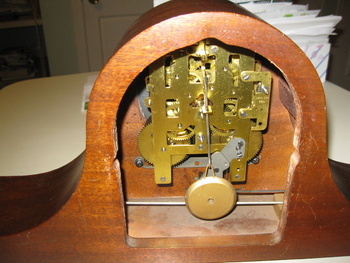 You can certainly wind the clock with a single ended key, of course, but the clock's movement was designed for use with a double-ended key. That small hole in the dial right about the "12" is used to easily regulate the clock's running speed. As a matter of fact, since the pendulum weight is not the adjustable type, that would be the only way to regulate your clock's speed. The small end of a double-ended key is applied to the arbor and turned clockwise to increase the clock's speed and counter-clockwise to reduce the speed. You might want to pick up a double-ended key for your clock as well and use the single-ended key you currently have as a back up. The regulator should be considered fragile. It is not hard to turn the arbor too far to the left, or right when using your double-ended key. Do not force it to turn. If you do this, you might strip the gears of the regulator and then your clock could end up needing costly repairs in order to get it to keep good time. Let us know what you find out regarding the key size and also let me know if you have any questions. Hello, I'm not an expert, but just wanted to report back and share with other Seth Thomas Lynton IW, Model E511-003 clock owners. Got a factory ST mantle shelf clock key size 6 and it fits correctly with our clock. Hopefully this bit of info helps...Thanks again, Bruce, for all the info and help you've provided! You're very welcome FlamingoCollector, and thank you for getting back to us all with your findings. The chime rod make for a very pleasant hour strike. Hello - I was just given my great grandmother's Lynton 1w as a gift from my aunt, it has a double ended key so I can provide measurements for both sides if they are still needed. It's a beautiful clock, still chimes on the half hour and hour and takes me back to my great grandmother's house every time :) The numbers stamped on the metal of the movement inside are slightly different than those reported above, they are "A200-033 5308", if that makes a difference on the key size. Let me know if I can provide anyone with any more information. 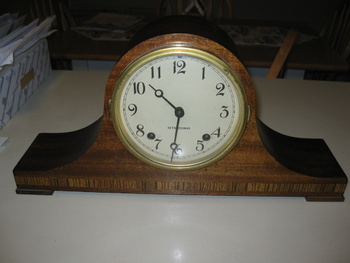 Welcome to Collectors Weekly and thank you for your offer to help with key sizes for this clock. I believe FlamingoCollector determined that this model uses a size "6/0000" double-ended winding key. Enjoy your family heirloom and thanks again!